In this first live video from Bilderberg 2017, Luke and Tim Pool discuss the latest technology gadgets right outside the conference venue in Virginia. They are experimenting with a 360-degree live stream, and discuss what hardware is useful for live streaming, including the use of drones, Gopro and 360-degreeras. They talk about what cell phones work well for recording. They discuss the various limitations of these devices and what works in live recording situations. Luke talks about how they have both traveled all over the world and covered all sorts of stories. Unedited and unbiased. Tim is a major part of this revolution, and they get asked what equipment they use to do our jobs. Tim talks about the GoPro and a gimbal mount for it, which is really good for interviews. They both prefer the GoPro 4 over the latest model. Most of the time they just use cell phones to live stream with. At Occupy Wallstreet, he was there with his DSLR, while Tim was on the outside using Ustream and he was picked up on several major networks. There was at least a million live viewers as occupy wall street was being shut down. Tim also uses drones to get footage, he shows off several different models of drones. One of Tim’s hobbies is to get 360-degree coverage of important live events, as it might be a legacy for the future. Drones can be difficult to use, especially if you are dodging flying rocks. Luke sees a big future for drones and these new 360 degree cameras. Tim Pool came down to check things out since Bilderberg is being held not far from where he lives. Luke says security is much more courteous here unlike last year in Europe where they were threatened with physical violence. 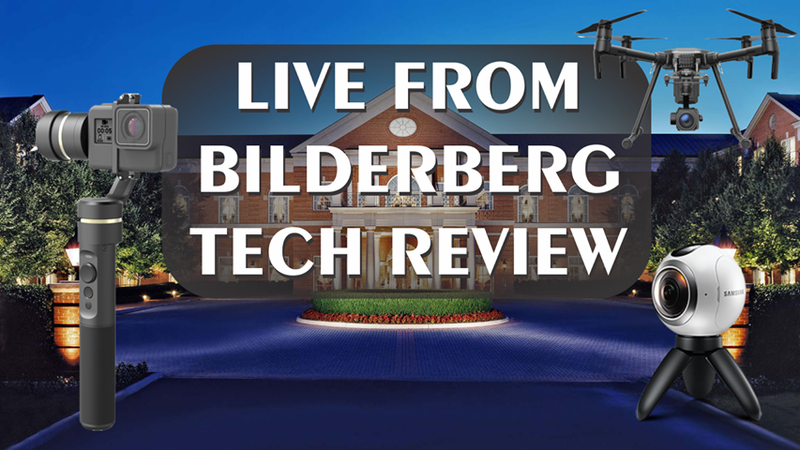 They at the Bilderberg Venue live along with Jeff Berwick of the Dollar Vigilante, Dan Dicks of PressForTruth, and Brittney Pettibone. They are all here at the hotel the day before it is put on complete lockdown and the security services take over. Security will be sweeping the hotel, setting up metal detectors and making sure the entire venue is completely secure. These meetings are fully off the record- the public does not know exactly what takes place here. And yet our tax dollars are used to fund this operation, which is treated like a G7 meeting. PreviousVIDEO: Angela Merkel Gets Drunk Slams U.S / Trump, Japan vs North Korea? NextVIDEO: Will Donald Trump Be At The 2017 Bilderberg Meeting?